HIFU (haifoe) stands for ‘High Intensity Focused Ultrasound’. During this treatment, ultrasound energy is used to stimulate the deep layers which support the skin. In doing so it creates a lifted, more taut appearance and stimulates the body to produce collagen. In a different form, this technique is used for heating and destroying cancer cells in the prostate. 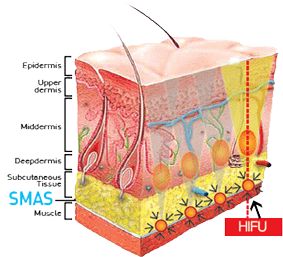 HIFU stands for ‘High Intensity Focused Ultrasound’. During this treatment, ultrasound energy is used to stimulate the deep layers which support the skin. In doing so it creates a lifted, more taut appearance and stimulates the body to produce collagen. Ultherapy addresses skin that is mild to moderately loose or lax, specifically by reconditioning and renewing the skin from within. Ultherapy will lift the brow, which in turn reduces excess skin on the eyelids, opens up the eyes, and gives a more refreshed look overall. Patients have reported firmer, more toned skin in others areas of the face and neck as well. Clients may witness some initial effect, but ultimately lifting and firming will take place over approximately 3 months, as collagen is renewed and replaced with new, stronger collagen. 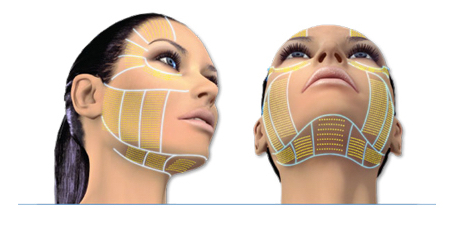 As this collagen building process continues, continued improvements can appear for up to 6 months. The majority of patients need only one treatment; however, some may benefit from more than one treatment (depending on how much laxity they have and their body’s own biological response to the ultrasound and collagen rebuilding process). What do i feel during treatment? Most people do not report pain. There can be slight aching over bony areas or a warm sensation in the skin during treatment. Dit is persoonlijk. De een voelt slechts wat warmte terwijl het voor de ander zeer pijnlijk is. Het kan ook per zone verschillen. Pijn is eventueel met een verdovende creme te verlichten. What do i feel after treatment? Sometimes the skin is reddish and a bit swolen after treatment. This will dissapear after a few hours. There is normally no downtime or recovery time needed. Most people return to normal activities right away.